DirectX 12 have just been publicly released by Microsoft on the Windows 10 technical preview. I wouldn't expect DX12 support until, windows 10 officially releases. (01-24-2015, 07:22 PM)ssakash Wrote: I wouldn't expect DX12 support until, windows 10 officially releases. windows 8 supports DX 12. 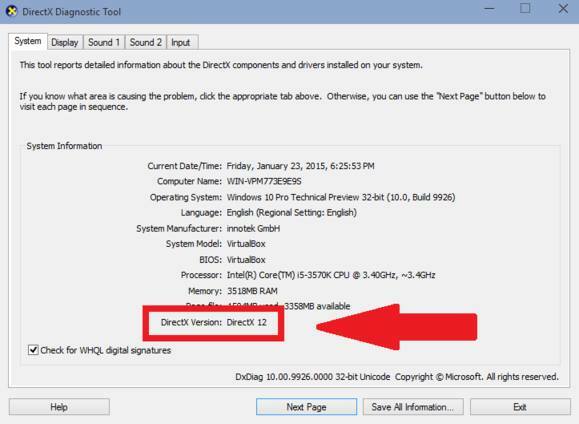 (01-24-2015, 07:25 PM)Serial Hacker Wrote: windows 8 supports DX 12. Though, you would have to ask gabest himself if, you want to know when, DX12 support will be available. Many benchmarks claim that there are about double the performance increase in pc gaming so, I guess it would offer nearly the same in emulation also. (01-24-2015, 08:03 PM)ssakash Wrote: Though, you would have to ask gabest himself if, you want to know when, DX12 support will be available. Many benchmarks claim that there are about double the performance increase in pc gaming so, I guess it would offer nearly the same in emulation also. Supposing the emulation side uses features whose performance has been increased. I reckon this alleged speed boost doesn't affect all DX aspects. People have said that GSDX would need to be mostly rewritten to fix the graphical bugs it currently has. As far as I can tell, adding DX12 support to the plugin as it exists now would not really improve accuracy without that rewrite. About all that could come of it would be Gabest being interested enough in DX12 to want to do the rewrite, but I'm skeptical that would happen. i dont expect it any time soon even with win 10 comes out. is gabest even actively working on gsdx still? I don't think Gabest is even active on gsdx anymore, and I doubt even with Win10's release he would do work on a rewrite with D3D12 support. Gabest updated GSdx recently(with OCL support). But I don't think D3D12 brings that much to the table. It's all about reducing overhead, so at best it would free up a bit of CPU time for main emulation. Other than that, not much. One should still keep in mind that in many games the DX10/11 renderer works better than the DX9. Maybe it will help to avoid other glitches if you have more instructions available. Why do we actually need this crc hacks? Could that be solved by new DX versions? But as already mentioned... DX12 will not solve Ratchet and Clank..